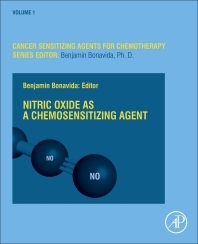 Nitric Oxide as a Chemosensitizing Agent, Volume One is the first book to describe several reviews by authoritative scientists and clinicians on novel findings in the reversal of drug resistant cancers by the combination treatment of Nitric Oxide and sub toxic concentrations of chemotherapeutic drugs that have been reported in both in vitro, in vivo and preclinical models. The book describes the various underlying chemical, molecular and genetic mechanisms by which NO and NO reactive species mediate the anti-cancer activity, thus reducing the threshold of drug resistance and enabling chemo therapeutic drugs to induce their cytotoxic activity and reversal of resistance. This book exposes scientists and clinicians to this highly beneficial topic for research investigations and pharmaceutical companies to new avenues for R&D. It is a valuable resource for cancer researchers, oncologists and members of several areas of the biomedical field who are interested in understanding how to use Nitric Oxide as a sensitizing agent for chemotherapy.